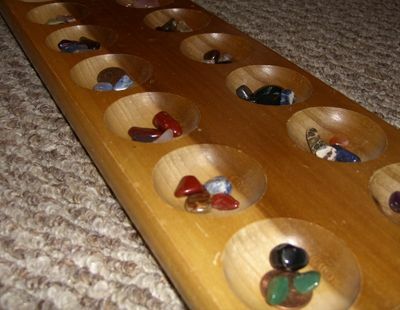 Mancala is an ancient game dating back to 6th century Africa. This is a simple and entertaining game where two players take turns picking up a cluster of tokens (typically stones) from one of twelve cups on the board and then move around the board, placing one stone in each cup they pass. If the last stone is placed in a cup with other stones then that player gets to pick those up and continue. A player's turn ends when the last stone is placed in an empty cup. Players are free to count their stones in order to devise the best strategy, but it is often difficult to plan more than a few moves ahead. Each player has a well on their right at the end of the board where they place a stone on each pass around the board. The goal is to make as many rounds as possible to get the most stones in your well. At the end of the game stones are counted and the player with the most wins.